Today we had the pleasure of welcoming Benny to the pack! 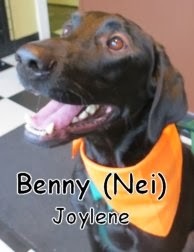 Benny is a playful and happy 2 yr. old Labrador Retriever. Benny romped hard with other fort fido regulars, Samwise and Odin as you can watch in the clip below! so much energy in this guy! we hope to see you again soon Benny, Have a great night, and weekend and we shall catch you next week! Happy Thanksgiving from everyone here at the Fort! Hey Folks, Ryan here, wishing everyone a glorious Thanksgiving feast. May it be full of pie, ham and turkey, 'till your hearts delight. While its great to get together with the family and friends, a lot of people forget that our furry friends are along for the ride! smelling and seeing the beautiful bounty can be quite tempting. So reward your dog and let him/her take place in the eating debauchery as well! I have featured a few recipes here earlier in the month, but just in case you missed them, here are a couple that I'm definitely going to try tonight. Mix together all of the above, and drizzle lightly with a tablespoon or two of gravy. Don’t give your dog more than one serving (approximately how much he’d eat anyway). Make certain there are no bones in the meat. Remember, while hot food tastes great to humans, dogs’ aren’t used to it. Let his food cool thoroughly. Next is a great article about sharing your dinner with your dogs, and gives you some knowledge on thanksgiving day food. The Goods and The Bads are listed there so that you can make your OWN specialty doggie dinner, remember to write down your recipe though, so you can do it again next year! This morning we were excited to assess Scout. 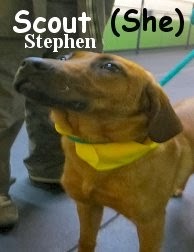 She is an eight month old, thirty-eight pound, brown and brindle, Labrador Retriever/ Bavarian Mountain Hound Mix. Now Scout is a very nice dog that is very sociable. She took to the Medium Roll with ease, and it was truly a perfect fit for her. Scout played a bunch with several different members of the pack, taking quite a liking to Georgie and Louis, among others. We are thrilled to have Scout amongst our ranks here at The Fort. We are also happy for her owners, they have scored a great canine companion. She's certainly welcome here anytime. First-rate job today girl! Checkout these two clips of Scout in action, she is having a blast! Meet Pupperton and Roscoe! They had their assessments yesterday. 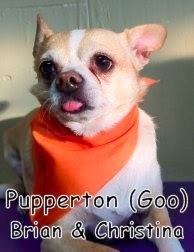 Pupperton is a five year old, seventeen pound, tan and white colored, Chihuahua. 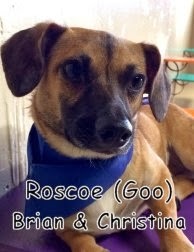 Roscoe is a one year old, twelve pound, brown and black colored, German Shepard/ Dachshund Mix. Both Pupperton and Roscoe hung out in Fort Fido's Little Roll. It was a new experience for them, so they weren't exactly sure what to make of it all. All in all, they did just fine. Although there wasn't tons of play involved, they seemed to relax into the pack a bit as the morning progressed. Given time and consistency, we believe Pupperton and Roscoe will began to get much more out of The Fort. For now, these two cuties are welcome anytime. Good job boys, we'll see ya again soon! 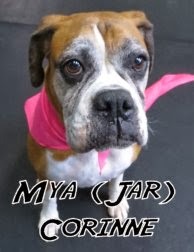 This weekend we had the pleasure of assessing this wonderful, 7 Year old, 60lb, tan and white Boxer named Mya. She started out the day in the big roll and enjoyed the whole experience of daycare quite a lot. She seemed to enjoy watching other dogs interact and play with each other, especially Rainier and Grady. We had a great time here with Mya and we look forward to seeing her again soon. A way to GET thanks this holiday! If you have faces like these watching your every move on thanksgiving, Try making some of this! It uses ingredients you've already got laying around the house, and it lets Fido become a part of the giving of thanks. 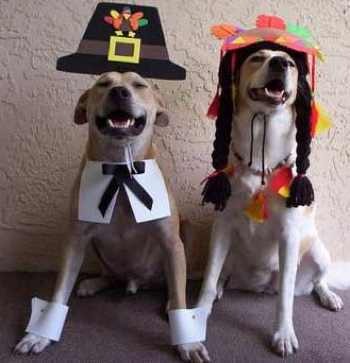 From all your pals here at Fort Fido, we wish you a wonderful Thanksgiving, and a great post-dinner food coma. Remember those sweat pants! On a more serious note, I can not stress enough how thankful everyone here at Fort Fido is, to have such a wonderful group of dogs, owners and friends. Thank you for you continued support and we hope to celebrate more and more holidays with you at our side! Some good ones today for sure, enjoy! I would like to remind everybody about a great event Fort Fido has coming up... Partnering with The Soggy Doggy Dog Wash and SUNDogs, of University Place, The Fort is participating in the "Spruce Up Fido" Dog Wash fundraiser. It's going to be a blast, and we hope you'll all mark your calendars to attend. It is on Tuesday, December 3rd, 2013 from 4:00 pm to 8:00 pm. The Fort Fido Crew will be there to wash your pooch for you, or with you, from 6:00 pm to 7:00 pm. Normal Soggy Doggy wash rates will apply. All proceeds that The Soggy Doggy acquires, from 4:00 pm to 8:00 pm, will be going to, and benefiting, the new off-leash dog park that the SUNDogs have in the works. When the Fort Fido hour begins, at 6:00 pm, all proceeds The Soggy Doggy takes in, will be donated to the SUNDogs, for the off-leash dog park project, on behalf of The Fort. Super cool! For those that do not know, the current off-leash dog park, located on the Chambers Creek Properties, and "in" the golf course lol, has always been "temporary". It has basically been an experiment since its inception. Things have been going well with it over the past few years, so it looks like the people in charge will be allowing it to continue. So now it is time to get ourselves a permanent off-leash dog park spot! Which of course, requires some fundraising. P.S. Also, the UP Fire Department will be visiting with an engine that day, at 4:30 pm. At 5:30 pm, folks get a chance to meet up with University Place Council Member, Caroline Belleci... Last but not least, if you show up, you will receive a $2 off coupon for the ever-popular, Santa Paws Photo Shoot, happening on December 7th. 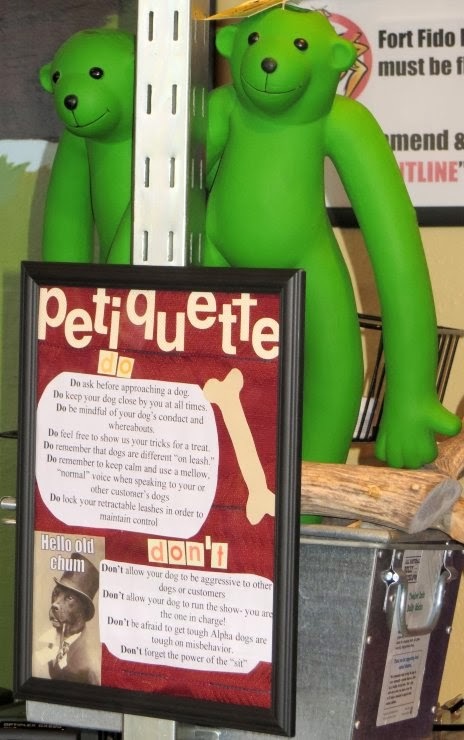 Checkout our new "Lobby Etiquette" signage. We put it up this last weekend, and it has some rather good tips for safety and control. Do ask before approaching a dog. Do keep your dog close by you at all times. Do be mindful of your dog's conduct and whereabouts. Do feel free to show us your dog's tricks for a treat. Do remember that dogs are different "on leash". Do remember to keep calm and use a mellow, "normal" voice when speaking to your or other customer's dogs. Do lock your retractable leashes in order to maintain control. Don't allow your dog to greet other dogs "on leash". Don't allow your dog to make decisions - you are the one in charge. Don't forget the power of the sit. Thanks for studying on this stuff guys! Here are a couple of clips highlighting some of the action from the large and medium areas this morning. This first video features Lucy the labradoodle and Brix the retriever, the next clip is of Summer and Buddy over in the big roll. Thanksgiving dinner is a meal we all look forward to every year, so why not share that same joy with our canine pets without having to just let them lick our plates Haha. Here is a healthy way to let Fido enjoy that succulent turkey they are smelling! Have A great weekend, and remember: No matter what you feed Fido this holiday season, be sure to keep those turkey bones out of the picture! As always, thanks for reading and be sure to check back next week! Take a gander at The Fort's newest member, Georgie! She is a ten month old, twenty-one pound, red and white colored, Boston Terrier. Now this little gal was eager to meet the pack. She did so with gusto, playing wholeheartedly in our Medium Roll. She's no stranger to canine socialization, this wasn't her first time at the rodeo lol. Georgie loves going to the dog-park, and has attended Dog Daycare regularly. 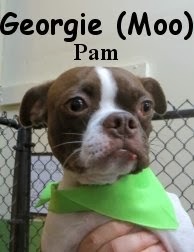 Georgie is welcome to attend Fort Fido anytime, and we look forward to seeing her high-spirited self again. Here's a clip of Miss Georgie in the thick of it, having a grand old time with Sahale, amongst several others. Meet Handy. 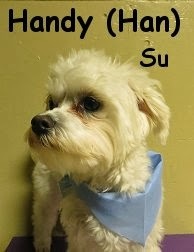 He is a fun-loving, ten month old, seven pound, white colored, Maltese. This spunky little fellow, had his assessment in the Little Roll. Handy did very well, and was quite eager to experience his new surroundings. He is confident, courageous, and carries a large, likable personality. Handy made playmates out of the other pack members quickly and easily. It was a wonderful first day for Handy. He'll be a pleasure for us to have here at The Fort. In the following clips, Handy gets to know Fort Fido regulars, Rusty and Buckwheat. The two were a perfect match-up for the Handyman. Belated, Happy Veteran's Day to you all. Thank you to those who have served, and a special thanks to all of our Fort Fido customers who have served, and are currently serving. Wishing you all the very best! Today we have three new dogs for you guys to meet. 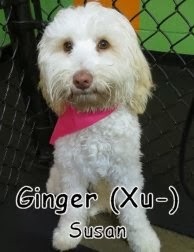 First up is Ginger, She is a 6 month old, 20lb, cream colored Labradoodle. She had her assessment on Saturday and did great. She was very friendly while meeting other dogs and had a wonderful time. 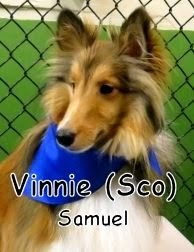 Next up is this 1 year old, 15lb, Sheltie named Vinnie. Vinnie is a great dog with a very relaxed personality. Vinnie enjoyed observing all the action in the medium roll today and although he didn't play a whole lot today, I'm sure after a few more days of daycare he will be playing hard with the rest of the pack. And last but not least, we got to meet the adorable little sister of Riley. 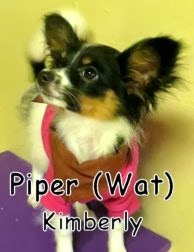 She is 4 month old, Papillon named Piper. Piper had her assessment this morning and did excellent. She was upstairs all morning and had an awesome time with her brother Riley and the whole pack. Well to cap off this week I figured we could all use some chuckles. Next a dog with about as much talent as any mainstream pop singer now-a-days haha! im sure a record deal is on the way! Have a great weekend and we'll catch ya next week! Does how you care for your dog indicate how you will care for your kids? A little belated Halloween-love from our buddy Louis... He is seen here, channeling his inner Willie Nelson. Too funny! "Willy" should try this too lol. Get a load of Triumph! He is a six year old, fifty-five pound, Australian Shepherd Mix, that hung out in The Fort's Medium Roll. Even though Fort Fido was new territory for Triumph, he is no stranger to the Dog Daycare scene, and seemingly enjoys the experience. 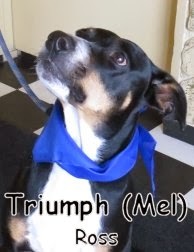 New to Washington, Triumph is a Veteran of Doggie Daycares in and around The Bay Area. From our observations, he very well enjoyed being in the company of other canines here. Although he didn't play much today, we hope, and suspect, that he will "bust out" in the future. Nice job today Triumph, we'll see you again soon. This weekend we had the pleasure of meeting a new pup named Jillaroo. she is a 6 month old, 24lb, tri-colored Mini Australian Shepherd. 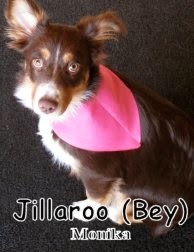 For those of you who don't know "Jillaroo" is an Australian nick-name for a young girl training to work on a sheep or cattle farm, it also makes a prefect name for this Australian girl. Jillaroo is a great dog with a great attitude and she jumped right into the action as soon as she arrived at the Medium Roll. Jillaroo especially enjoyed playing with Pupcake (A fellow Australian Shepherd) and Sammy (Puggle). Jillaroo did an awesome job this weekend and we look forward to seeing her again soon. While all dogs possess the ability to be a good dog, being an ambassador between humans and canines is a little more difficult, and requires some training (on both the pup's part and on the human's). The AKC or American Kennel Club offers a special chance to train, test, and reward your dog for their good behavior, or to help you identify where your companion could use a little help. 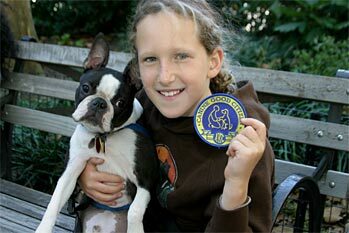 "Started in 1989, the CGC Program is designed to reward dogs who have good manners at home and in the community. The Canine Good Citizen Program is a two-part program that stresses responsible pet ownership for owners and basic good manners for dogs." Any dog that can pass the 10-step CGC test receives a certificate from the American Kennel Club, And also,an opportunity to start other AKC programs such as agility, tracking, or performance events. State legislature has even begun recognizing the CGC program as a means of advocating responsible dog ownership and 34 states have Canine Good Citizen resolutions. Now, the reason I write this in our blog is because Zeus, one of our fine looking Doberman has completed his training and has passed that rigorous test, and is a fully fledged member of the AKCCGC!! Congratulations to Zeus and his owners for all the hard work that was put into making this a reality! Good Work Buddy! Thanks for reading, see ya next week!